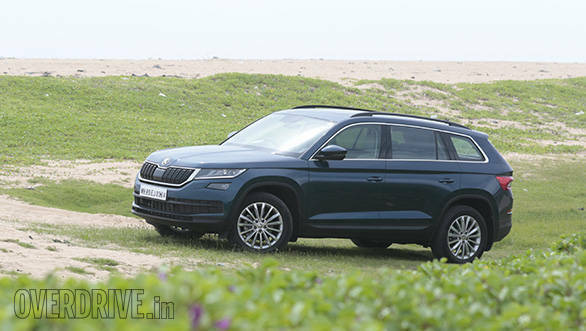 The 2017 Skoda Kodiaq has been launched in India and the price that Skoda India is asking for its first seven-seater SUV may seem a bit steep when you consider the competition that it now faces. Earlier, we had estimated that the Skoda Kodiaq will be priced in the same ball park as the Hyundai Tucson and the Volkswagen Tiguan. The specification sheet put the Kodiaq on top, on paper at least. However, the price announcement today has put the Kodiaq in the battle field with two established giants, the Ford Endeavour and the Toyota Fortuner. The Skoda Kodiaq is priced at Rs 34.49 lakh (ex-India) whereas the Ford Endeavour 3.2 AT 4x4 is priced at Rs 31.40 lakh and the Toyota Fortuner 2.8 AT 4X4 will set you back by Rs 31.62 lakh. Both the Ford and the Toyota, at this price, significantly undercut the Skoda and also offer a lot more equipment for the money. Taking the specifications into consideration, the Skoda Kodiaq is 4697mm long, which on its own makes it a long vehicle. 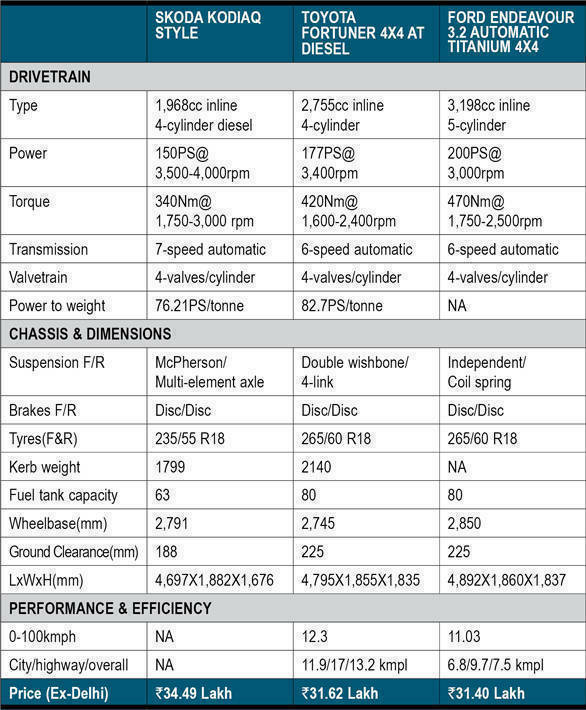 However, the Fortuner is about 100mm longer, at 4,795mm and the Endeavour is the longest of them all, at 4,892mm. The Endeavour's wheelbase is also the longest, at 2,850mm, followed by the Kodiaq 2,791mm and the Fortuner 2,745mm. The specs do suggest that the Endeavour is the roomiest SUV in this class. The Fortuner and Kodiaq, on the other hand, seem to be pretty close. All SUVs here seat seven passengers. The Endeavour also comes out on top in an engine specification shoot out. Its 3.2-litre, five-cylinder, turbodiesel makes 200PS and a massive 470Nm of torque. It comes mated to a slick 6-speed automatic transmission. The Toyota Fortuner's 2.8-litre diesel makes 177PS and 420Nm which is higher than Skoda's motor, that's the smallest of the lot. The 2-litre turbodiesel, in the Kodiaq produces 150PS and 340Nm. The Skoda is clearly at a disadvantage in terms of sheer power and torque, but its trump card is the slick, 7-speed DSG box, that's pretty quick, as we discovered on the first drive. We shall update this story with acceleration times when we test the new Skoda Kodiaq. The biggest challenge that the Skoda Kodiaq will face, however, is off-road capability. The Skoda gets a Haldex sourced all-wheel drive system, however, it doesn't have low ratio unlike the Ford and the Toyota. This limits the off-road ability of the Kodiaq to some extent and we have already established that the Endeavour and Fortuner have excellent off-road ability. 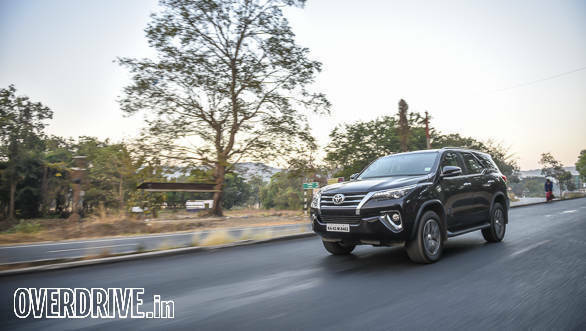 The Endeavour and Kodaiq also get a set of driving modes that alters the drivetrain characteristics to suit the terrain that the SUV is driven on. The Fortuner only makes do with an Eco and Power Mode. 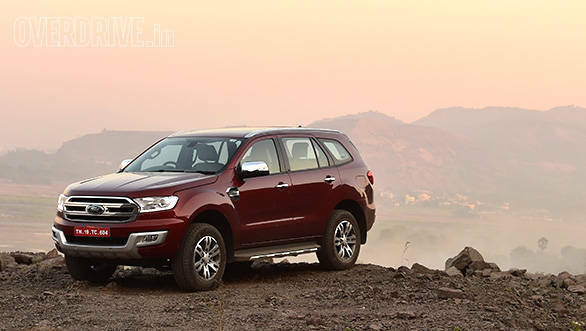 The Ford Endeavour and Toyota Fortuner undercuts the Kodiaq by close to Rs 3 lakhs. We shall compare these SUVs in a full-blown comparison test, but for now, this is how the Kodiaq stacks up against the Endeavour and Fortuner, on paper.